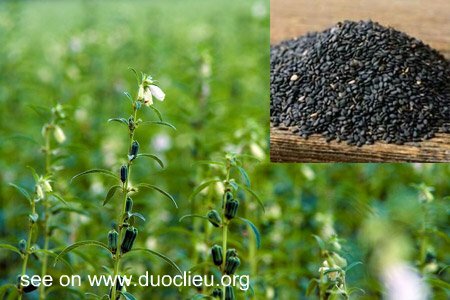 Black sesame seed (Heizhima)-Sesamum indicum nigrum L.
Botanical Name: Sesamum indicum nigrum L.
Common Name: Black sesame seed. Part Used & Method for Pharmaceutical Preparations: The ripe sesame seeds are gathered in autumn, then they are dried in the sun. 1. Deficient essence and blood manifested as dizziness, blurred vision and early graying of the hair. Black sesame seed (Heizhima) is used with Mulberry leaf (Sangye) in the formula Sang Ma Wan. 2. Constipation due to dryness in the intestines. Black sesame seed (Heizhima) is used with Chinese angelica root (Danggui), Cistanche (Roucongrong) and Arborvitae seed (Baiziren). Cautions & Contraindications: This herb should not be used in cases with diarrhea.